A CCTV image capturing a shop robbery has been released by police in the hope somebody recognises the suspect's distinctive clothing. Kent Police said a man stole more than £100 from Premier Stores in Peel Drive, Sittingbourne, just after 1300 GMT on Wednesday. 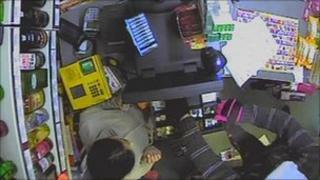 The image shows a man, wearing black gloves with bright pink stripes, taking the money from the till. Police believe an accomplice waited outside the shop. Det Con Jonathan Pearce, of Kent Police, said: "This happened in a residential area in the middle of the day when people would have been going about their normal business. "I'm convinced someone must know who he is."